Boat Names - the Blog: Did Name Changes Doom Wolf of Wall Street Megayacht? Did Name Changes Doom Wolf of Wall Street Megayacht? We just read a gripping article about the sinking of the megayacht Nadine, which was depicted in the movie, "The Wolf of Wall Street", and couldn't help but wonder if the yacht's multiple name changes didn't have something to do with her ultimate demise. It's in our nature to wonder such things. After all, we are the boat name blog. Nadine and other true stories at sea. In fact, the article on Yachts International (taken from the 14-year-old book, “Megayacht: True Stories of Adventure, Drama and Tragedy at Sea”) states that the vessel had undergone at least four name changes since her initial stint as "Matilda" in 1961. Other names included "Coco Chanel", "Jan Pamela" and "Big Eagle". 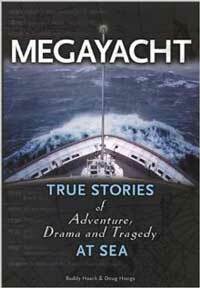 The full article is available at Yachts International, as well as in the book, “Megayacht: True Stories of Adventure, Drama and Tragedy at Sea”, which is out of print but available on Kindle at Amazon.com for a few bucks per download. We always encourage folks to change a boat's name when taking ownership, but perhaps five different names over a boat's lifetime is too many for the gods of the sea to bear.